I suppose, having looked back at 2014, I ought to do a post looking forward to 2015. I usually try to avoid posts like this as writing down plans here is usually the kiss of death to them. So I’m going to keep this as brief as I can and try not to over-commit. Specifically to ensure that I spend less on gear than I do on walking trips. Furthermore, to try to only buy new gear funded by selling old stuff I no longer use. After all, I have pretty much everything I need already. This is partly taking inspiration from Alastair Humphreys’ “Year of Microadventure” and partly from the fact that it’s something I’d intended to try to do in 2014 (but was clever enough not to publically commit to!!). 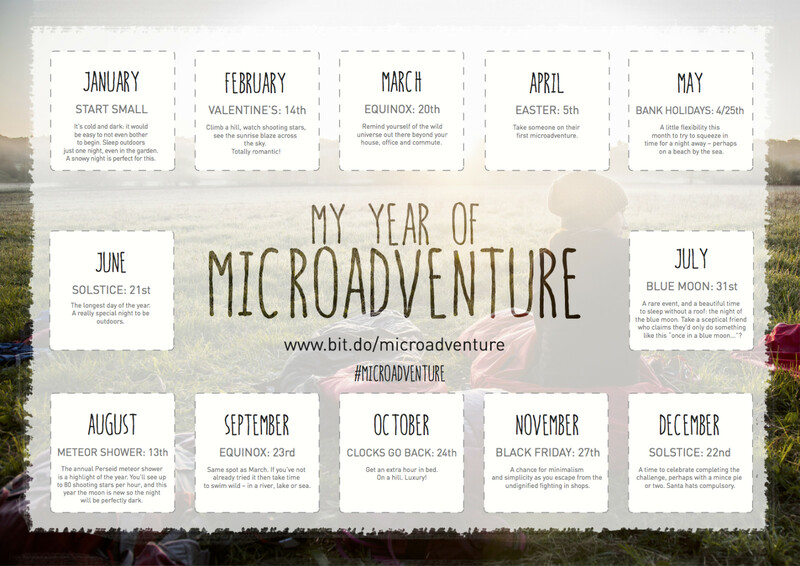 Yes, I know we all have started to find the term “microadventure” a bit grating, but the underlying idea is sound. The pure form of Humphreys’ year of microadventure involves sleeping out cowboy style rather than in a tent, but I’m not going to restrict myself in that way – I intend to count any form of sleeping out, but it will be a wild camp at least. And I’m going to allow myself to do them as part of longer trips rather than necessarily a stand-alone overnight. The key thing is getting out for a camp in every month. This is something that I can do whether I’m working or not, as I showed in April 2014 when I slept out on Arthur’s Seat whilst on a business trip. Humphreys has built his twelve item ticklist around astronomical events and various notable dates during the year. I’m going to try to hit the key astronomical events if I can – these include the Perseid and Geminid meteor showers in August and December, a lunar eclipse in September and a solar eclipse in March. For the other months, we’ll just have to see how it goes. Firstly, the 10 in the western fells break into a main group comprising the Blake Fell set (4) and Fellbarrow set (2), a subgroup of the Seatallan set (3) and a lone one in the form of Haystacks which is being saved for last. Try as I might, I haven’t come up with a way to do all 9 of the fells (ie excluding Haystacks) on a single trip, so have had to concede this is likely to be two trips. Haystacks itself is being saved to coincide with Gina’s summer party weekend so that a group can do it and celebrate together. It was always the cunning idea (well since the late summer) to finish that weekend as it will also mark exactly 10 years since I started the project, the anniversary falling on the 17th July. When it comes to the 6 Northern fells, these are the entire Blencathra set plus a straggler of Carrock Fell, left over from when I did the Cumbria Way in 2011. I can probably do all of these in one trip. However, tackling this set has now eluded me 3 times, all due to nasty weather. I’m about due a decent forecast for these fells. As if the above isn’t complicated enough, there are two other considerations – cars and company. I’ve written before that my goal is to make this a carless round, and I’ve done pretty well at avoiding use of a car, this year in particular redoing almost all of the fells that had involved a car previously. Despite adding two more to the list in 2014 (Great and Little Mell Fells), I managed to clean them up too and I now have just two to revisit – Scafell Pike and Great End. However, the mere fact of a group walk on Haystacks on summer party weekend means I’m almost certainly going to drive up to the Lakes and use a car whilst there, especially as Mrs Hillplodder will be with me. So I’m expecting to add Haystacks to the list for a repeat, so although it will be my last new fell visited, I won’t really consider the round fully done until I revisit it without a car later on. I intend to return at some point later in the year and combine the repeat with a camp. At some point I also want to have done all 214 solo, and of the 198 I’ve done so far, 190 have been done alone on at least one visit. I’m not bothered about doing them all solo before my 214th, but I’m trying to avoid adding extras to the list as I visit new fells. Soloing the stragglers isn’t an objective for the year, but I do take these into account when planning walks. It’s also why I try to keep new fells for my solo walks, and fells I’ve done before for walks with others. The map below shows (in red) those yet to be visited at all and (in black) those needing a revisit without a car or other people. Notice the vague wording. The plan is to do the Saxon Shore Way, which I intend to do with my Dad. However, this does make it harder to coordinate walk days and is likely to drag out the timescale. So I’m not committing to that specific path in 2015, merely “a path”. Certain days on the London Loop last year really whetted my appetite for these and two incidents in particular. Not having read ahead in the guidebook, coming suddenly across the site of the Battle of Barnet in 1471 and the spot where Wilberforce talked Pitt the Younger into the abolition of slavery were the key moments. I have a number of ideas for historically-themed walks, and I’m just going to see which ones float to the surface. I’m going to try to make at least one a multi-day walk though. I also have a set of things I can bag in London and hence fit them around work quite easily. In past years, I’ve taken art materials on a trip and not used them, finding the exertion required to climb hills incompatible with sitting calmly for a couple of hours capturing the view. But having got myself to a better standard during the year and succeeded in some painting en plein air, I’m going to try to build this into as many walks as possible. Tors and rocks bagged in red, unbagged in black, Those visited pre-Social Hiking are in hollow red. I do also intend to include some wild camping on Dartmoor in this too. Despite my review of 2014 taking two fairly lengthy posts, and having clocked up a record number of walks and trips, I still fell short of my primary walking target of the year, which was simply to achieve 3.65 million steps (ie 10,000 per day for 365 days), the deficit being 299,000 steps. This may seem odd given 633 miles of walking (and the 21 vertical miles of ascent mean more steps are done when climbing), but it’s quite simple – when I wasn’t out wearing hiking gear, I was sat on my arse at home, so never quite made the average (I did get to within 30,000 steps of being on target at one point in September – it’s when the winter starts to descend that the rot sets in). After a slow start caused by work in Edinburgh, I spent most of the year playing catch-up, so actually did quite well for most of the time, but the final scores don’t reflect that. So the aim for 2015 is to actually hit the target, and I’ll be monitoring it by week and month to make sure I do. While I’m at it, I’d like to beat the hike distance and ascent figures too. Plenty of ambition there Matt, good luck! Some great ideas in there Matt. I’m also inspired by Al Humphrey’s wild camp calendar and Chris and I are going to try and get out each month. Like you, we’ll probably shuffle the dates to suit our own agenda, but it would be good to coincide some of our trips! Have a great 2015 mate and let’s catch-up soon. Yes, let’s definitely try to coincide some of them. It’s always much easier to get a pass out if it’s with others. I look forward to trouncing you on the Fitbit table. Hi, definately Some inspirational targets in there. I noticed in your edingburgh wild camp you was using the rab ridge raider and mentioned you got a bit wet, if you dint mind sharing, what is your overall opinion of this shelter as im thinking of getting this model? Also i noticed your local to me (Essex) so i’m most impressed with how many trips to “the north” you have managed but seeing as your an Essex boy have you managed to find any good wild (stealth) camping spots in or near to Essex youd be willing to share? Just getting back into walking / hiking myself after many years out so any local tips would be much appreciated. 2. In 2014 I managed 8 trips to the Lakes, although 1 of those was purely social. I got to Wales once and the Peak District once. All of my “trips” to Scotland were work trips, and I just did stuff within the Edinburgh city limits. It’s worth saying that 2014 was exceptional – previously the most I’ve ever been to the Lakes in a single year was 3 times, and in 2015 I would expect to get up there 4 or 5 at most. I also got to the South West 3 times – and in terms of journey time it’s as long as travelling to the lakes. In total I’ve done 26 walking trips to the Lakes over the last 10 years, all but one of which was by public transport. 3. I’ve not found any good Essex spots sadly, although I keep meaning to, and my camping out every month objective will almost certainly make me venture out for some local camps. Clearly the nature of the terrain here is that stealth is the only realistic option. I reckon there are some options along the Thames and also on the fringes of the various country parks, other than that it’s odd bits of wood and field edges. I did see a few nice spots when I was doing the London LOOP, mostly on the north and east side of the walk too. A couple of decades ago I used to spend pretty much every weekend sleeping in what is now called Hadleigh country park (it was just called Hadleigh Downs to us at the time) we only ever got moved on once but it turned out we were actually sleeping in someone’s back garden 🙂 My shelter of choice then was a german army poncho teamed up with a 58 pattern sleeping bag, hardly lightweight gear but it wasn’t far to walk. Thanks again for the reply and thanks for the link to the Bivi review. I’m trying for the ‘sleep out once a month’ challenge, starting with Wicken Fen at the end of January, my first ever winter wild camp. Excited but a little apprehensive! That is a lot if stuff to do or make a start on (thinking the Dartmoor tors here). Inspired by your Wainwright’s – solo and no car. Impressive.